Hang holiday lights like a pro in two hours or less with these expert step-by-step tips for planning, choosing, and hanging Christmas and holiday lights. Buy Christmas Lights at Amazon Now! The best time for hanging Christmas and outdoor holiday lights is before your weather turns wet and cold. Not only is it easier and more comfortable to work outdoors in mild weather, but it is also safer. Safely climbing ladders and working along the eaves of a roof can be a dangerous challenge in bad weather. Hang lights like a pro in under two hours. Even if you don’t actually hang your light strings well ahead of the season, you can get much of the preparation done, such as running outdoor extension cords, installing hooks and hangers, and so forth. It’s also smart to test your Christmas lights before it’s time to hang them. (You can buy an inexpensive Christmas light tester on Amazon.) Pull them out of storage and check them to make sure they’re functional. 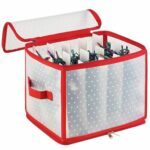 This way you will have plenty of time to make repairs and a shopping list for replacements and other supplies. Most home centers and other retailers begin stocking Christmas lights and supplies well before Halloween, so taking care of your shopping early is easy. Buying the gear online is even easier for most people. Map out where your lights will go and make sure you have enough working lights for that area. Use a long tape measure to figure the number of strands you will need. Be sure to take into account the eaves, windows, doors, shrubs, trees, and the like. Before hanging any lights, plug them in to make sure they work. 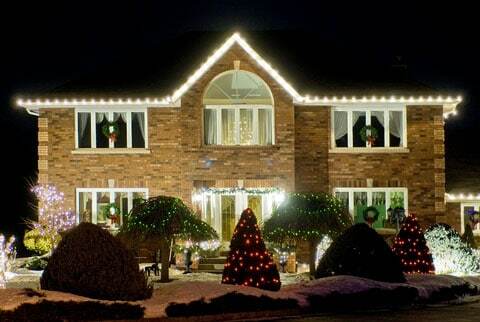 When buying lights, opt for shorter rather than longer light strings. That way, if a string stops working, you can replace it more easily and affordably. Light strings that have a male plug at one end and a female plug at the other end are best for connecting together from end to end. Outlining your eaves and windows and festooning your trees and shrubbery with decorative lights is a sure way to enliven your home for the holidays. 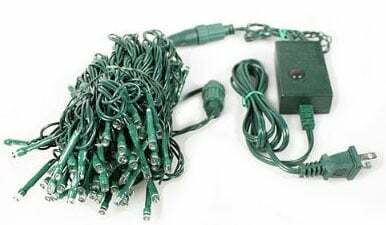 But hanging outdoor holiday lights can be a less than cheerful experience, particularly when you’re faced with a teetering ladder and tangles of light strings that don’t work. Many different types of decorative lights are available, from conventional mini-lights and icicle lights to mesh-style light strings made for wrapping tree trunks. You can choose clear, white, or colored lights that stay solidly lit, blink, or chase. The right style for your home will depend upon the look you want to create and your budget (not to mention the energy requirements for the lights), so be sure to take your time when shopping. Lights designated “C-7” and ”C-9” have 5- or 10-watt bulbs similar to those used in conventional nightlights. “Mini-lights,” as the name implies, utilize miniature bulbs; they are, by far, the most popular today because they are inexpensive to buy and to power, thanks to their cool-burning 1.5- or 2.5-volt bulbs. The larger C-9s and C-7s become very hot and consume considerably more energy than the same number of mini-lights. On the other hand, C-9 and C-7 light sets are heavier-duty than mini-lights and are more reliable. If one bulb is broken, missing, or twisted in a mini-light string, all or part of the remaining string won’t work. This isn’t the case with the larger bulb sets; they continue to operate. LED Christmas lights are initially a bit more expensive than conventional lights, but they burn cooler, use less electricity, and last much longer. C-7 Christmas lights or C-9 Christmas lights or Christmas mini-lights or LED Christmas lights. Outdoor power stake has 6-foot cord, built-in timer, and six places to plug in lights. The most convenient light strings have a male plug at one end and a female receptacle at the other—you can plug them together from end to end, which makes them easier to route. 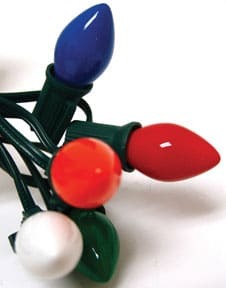 In the case of mini-lights, short, 50-light strings are often a better bet than longer 100-, 150-, or 200-light strings because you can easily unplug and replace a defective string. Regardless of the type you buy, choose lights that are UL-approved for outdoor use. 1 Locate an electrical receptacle. 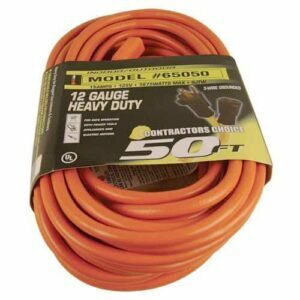 Plan to run heavy-duty extension cords from a working 120-volt electrical outlet protected by a ground-fault circuit interrupter (GFCI). Ideally, use a switch-controlled outlet, or plug the lights into an automatic timer. Both the receptacle’s circuit and the timer must be rated to handle the combined amperes of all the light strings. Do not use an indoor timer outdoors. How many strings do you need? 2 Measure the lengths. Using a long measuring tape (ideally 25 feet or longer), measure the length of your house along the ground. Also measure its height and the height of any bushes or trees you intend to light. Then measure the lengths of the light strings you will need to outline doors or windows. Figure the number of 50-foot light strings it will take for all of these measurements. 3 Test the lights. Before you plug them in, visually inspect the light strings, looking for broken or missing bulbs and worn or defective wiring. If you discover faulty wires, replace the string entirely as this could present a fire hazard. If bulbs are broken or missing, replace them. 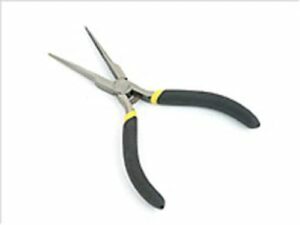 Use needle-nose pliers to extract a bulb. To extract a broken bulb, wear gloves and use long-nose pliers (pull mini-lights straight out; unscrew C-7 or C-9 bulbs counterclockwise). Once a light string is complete, plug it in and check for burned-out bulbs. Unplug the string before replacing faulty bulbs and then retest it to be sure all the lights work. If the string doesn’t work at all, check it for a blown fuse, per the manufacturer’s directions. If the fuse has blown, replace it; if it blows again, replace the entire string. Use plastic clips for the gutters. 5 Hang the lights along the eaves. 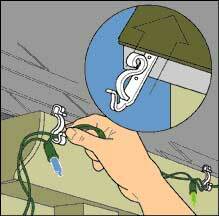 Your objective is to hang lights as easily and safely as possible without marring your home’s trim or walls. For attaching lights along gutters or the roof, use plastic clips made for the job—these grip shingles or gutters and have a lower hook that holds a light strand or extension cord. Use tube-light or nail-on clips. 6 Attach the lights to the trim. For attaching lights to window trim and similar vertical surfaces, use rope light clips or adhesive or nail-on plastic string light clips, readily available online or at home improvement centers. Space them about 12 inches apart or as recommended. 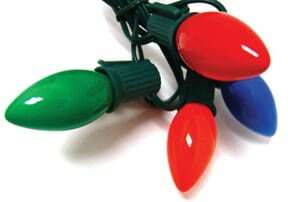 Do not use staples or nails to hang light strings—they can pierce or wear away the protective insulation, creating an electrical hazard.